As a professional historian for 46 years, a longtime Canadian art collector, the Director of Research, and the Acquisitions Curator, of a Canadian museum collection of over 4,500 antique paintings, material memorabilia, and historical commemoratives, the story of the Morrisseau forgeries aroused our interest. As a longtime, leading Canadian visual artist – as a top Canadian cinematographer, and film and television editor, for over 34 years – exploring and evaluating visual media of all kinds has been, not only a professional preoccupation for decades, but a personal passion for over sixty years, since I was given my first camera in 1953. My life as a visual artist started as an 11 year old, with this actual camera in 1953. I have made sleuthing out frauds, fakes, and forgeries, and the kinds of people who deal in them, a specialty of mine, and have published many academically analytical and sumptuously illustrated articles on topics dealing with: fake combat photographs, fake military bugles, fake bronze art sculptures, fake history book illustrations, etc., and on authenticating antique paintings, and historic memorabilia items made of ceramics, wood, metal, parian, plaster, fabrics, and leather, and other materials. Some of the research and documentary evidence prepared by John Goldi and Joan Goldi, on the Morrisseau Hoax, and submitted to court. ALL the science and ALL the independent experts are in full agreement on which paintings are authentic. And are at total odds with the tiny handful, of self-serving naysayers. Awarded the “CSC” – John Goldi csc, was awarded the “CSC” – Canada’s highest honour for a director of cinematography – “for outstanding achievement in the art of cinematography” by the Canadian Society of Cinematographers, the professional organization of Canada’s film and television cinematographers. Academic – John Goldi csc pursued university studies leading to an Hon. B.A. in Modern History, at the University of Toronto, Toronto, ON, and a B.Ed., and an M.A. in History, at Queen’s University, Kingston, ON. International Awards – He has won over 136 international film and television awards at major American Film and Television Festivals (New York, Chicago, San Francisco, Los Angeles, State College, Houston) for his educational film and TV documentary work, in competitions featuring the best work of producers from around the world. Educational Films in Distribution – His educational films and television programs – which he has created together with his producer wife Joan Goldi, can be found, in hundreds of schools, universities, public libraries, public service organizations, corporate and government offices, and countless private homes in every Canadian province and territory, and every American state, except Hawaii. After leaving behind six years of living in remote far northern Canadian settlements, in 1979, John Goldi never trapped or hunted again. He had hunted and trapped because he felt, that as school principal, he should share in the lifestyle of the parents and students of the communities in which he was serving as an educator. Years in Remote Aboriginal Villages – John Goldi lived for eight years in remote non-white Aboriginal villages, in Africa and in the Canadian far north, for six years as an educator, school principal, hunter, and trapper. He travelled annually, for hundreds of miles, in remote wilderness arctic and sub-arctic regions, by boat in summer, and snowmobile in winter, always in the company of Inuit or Dene hunters, going after seal, caribou, moose, bear, geese, swans, and ducks. He learned how to butcher an entire moose by himself, and to skin, and stretch the lynx, fox, mink, marten, and weasels that he caught on his own trap line, afterwards selling the fur to the Hudson Bay Company. He built his own massive Inuit komatiks (sleds) and Indian toboggans, and constructed his own 16 x 20 foot log cabin. For nine years after that he worked out of Yellowknife – with his wife Joan Goldi – as a documentary filmmaker, creating numerous educational and heritage promotional programs with and for Inuit and Dene groups and with Canadian federal government agencies. Museum Acquisition Curator – As the Director of Research and Collections, for the Canadian Anglo-Boer War Museum, John Goldi’s years of intense research, and single-minded scholarly determination, were entirely responsible for the Museum having a collection of 4,415 antique memorabilia items (in addition to 1,200 books), all of which he authenticated, curated, and acquired for the collection. A jawbone from a member of the lost Sir John Franklin Expedition of 1845, found on a hunting expedition in 1975 on King William Island in Canada’s remote central arctic. The collection of antiques includes furniture and paintings, photos, autographs, documents, uniforms, weapons, equipment, and tools, as well as historical items of glass, ceramic, plaster, parian, earthenware, fabric, leather, metal, wood, paper, ivory, bone, and stone. After many years as Director of Research and Collections for the Canadian Anglo-Boer War Museum, he became its first Honorary Curator Emeritus in 2013. A fabulous, rare, original lithograph, of Joseph Brant, hand-painted in 1834 for the McKenney and Hall folio of famous Indian chiefs. “The Archival Fraud Detector: Distinguishing Originals from Repros 1600 – 2010” – Comprising 20 huge galleries featuring hundreds of lavish pictorials, it is the biggest educational display any museum has ever mounted anywhere in the world, to give ordinary people the tools anyone can use to tell an original painting, print, or photo, from a dupe, a repro, or a fake. “The Killing of Dudley George” – On Dec 8, 1995 my wife Joan Goldi and I met with the SIU (Ontario’s Special Investigations Unit, which investigates all deaths of civilians at the hands of police) and presented our research, collected over 73 days behind the barricades of Cadet Camp Ipperwash, after an Ontario Provincial Police attack at midnight against unarmed and defenceless First Nations women, children, and men at Ipperwash, Ontario. The attack ended with the killing of Dudley George, the only Aboriginal Canadian killed in a land claims dispute with police in the 20th century. Our research proved conclusively – the SIU believed us – that contrary to all media accounts at the time, the police were lying when they said they were firing at Indians in self-defence, after being fired on by native gunmen. And the media, for some 8 months was totally collusional with the white OPP against the Indians, in what is the most sordid chapter of racist behaviour by the media in Canadian history. Because of the outrageous racist behaviour, by so much of the “white government and media Establishment,” for many months, during and after the shooting, my wife and I had been the only media allowed behind the barricades, which prevented all outsiders of any kind, including police, from entering Camp Ipperwash. We convinced the SIU – which was just preparing to announce at a Press Conference scheduled for Dec. 11, that no charges would be filed against any police officer in the killing – to re-open its investigation, and offered to provide access behind the barricades, till then blocking out all outsiders, including all police, government, and military officials. The SIU’s re-launched investigation, which we filmed, ended up charging an OPP officer for deliberately killing Dudley George. Years later, a court substantiated that our original research to be absolutely correct in every respect, with the judge confirming all our findings from December 1995: numerous police officers were lying in court, the Indians had no guns nor fired any, the police were not firing in self-defence, but launched an unprovoked shooting attack against women, children, and men, and that Dudley was the subject of a targeted killing. Our massive documentation for this huge civil rights and human right violation, which we provided to the SIU and the Canadian Broadcasting Corporation executive producers, in December 1995, ultimately resulted in the launching of the Ipperwash Inquiry, which spent two days at our house reviewing our interview videos which we had shot only months after the shooting, ten years before, of all the Indians at the murder site. The Ipperwash Inquiry added no substantive new information on the civil and human rights abuses, beyond those which we had reported on, to the SIU, and to the CBC, with our private investigation of ten years before. Lawyer Susan Vella, while billing the tax payer for millions for herself, refused to pay nickels and dimes, for expenses she owed to John Goldi for ordering him to make a court appearance at Forest, Ontario, 267 kms from Toronto. But while Joan Goldi and I spent our own money, during our 73 days of investigation, at Forest and Ipperwash, Ontario, during late 1995, and early 1996, paying for our own motel, food, and car expenses, for driving 11,000 kms back and forth between Toronto and Ipperwash, the Ipperwash Inquiry lawyers billed tens of millions of dollars for themselves, in salaries, room and board, per diems, expenses, and car milage charges. Was that good value for Ontario tax dollars? To add insult to injury, when the Inquiry lawyer Susan Vella, who had cribbed tons of my video and documentary research from 1995-96, demanded that I show up to testify in Forest, Ontario, she refused to pay me the normal per diems, nor the normal car mileage expenses, for driving from Toronto to Forest, Ontario, which she paid everyone else. She refused to pay nickels and dimes, rightly owed to the original investigative reporter who had made history, in uncovering a historic human rights abuse, while she – a “Susan-come-lately” lawyer, billed millions for herself. Cadet Sgt. John Goldi at Camp Ipperwash in July 1958. He would go on to become a Cadet Major and the commanding officer of his high school cadet corps and attend Camp Borden and the National Cadet Camp at Banff, Alberta. It is also true that not a single Indian got a nickel from an Inquiry that cost Canadian taxpayers 20 million dollars, all of which went to a white judge and white lawyers. Not a nickel for the George family for Dudley’s wrongful death, not a nickel to the teenagers who were wounded by rogue police gunfire, not a nickel for Indian private property damaged or destroyed by police gunfire, not a nickel for post traumatic stress disorder, for Indian families who had their children shot at by a renegade police action. Investigative Journalist John Goldi standing on the same spot, 50 years later, in 2008. It is a fact that, out of revenge, Ontario Provincial Police officers, for years – many years – after the evemts in 1995, routinely stopped and harrassed many of the Indian women who came out of Camp Ipperwash to drive to their places of employement in Forest. They, and their children, continued to live in terror for what else could happen to them at the hands of police for years afterwards. Ipperwash is a classic case of white men using or exploiting Indians for their own benefit, that started in the 19th century, with stealing Indian lands for nickles and dimes, and false promises that were never kept. It all has erie echoes in the Norval Morrisseau Hoax. Canadian Norm Pearson’s 1917 World War I, Canadian Siberia Expedition Bugle and dog tags. “Distinguishing Fake Victorian Military Bugles” – Ten lavishly illustrated galleries showing any collector how to tell whether the bugle they have, or are considering buying, is a fake Indian or Pakistani knock-off, or a genuine Victorian militaria memorabilia item. “Stoned on Rock Relics” – It is the first academic attempt anywhere in the world, to suggest a scientific classification system for stone or rock relics, and features 319 lavish pictorials dividing all commemorative stones into bystoneders, shiftstones, utilistones, and alterstones. “Those Faking Combat Photographers…”– Six huge galleries featuring hundreds of lavish pictorials, is the biggest exposé of faked Victorian, Edwardian, and Georgian combat photography ever published by anyone. 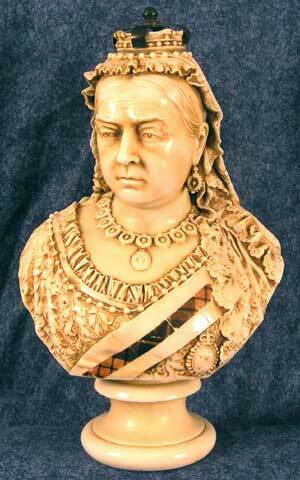 A large and fabulously rare Victoria 1887 Jubilee bust by RJ Morris. “Falsies: Fake Busts & Historical Statues – 1839 – 1918” – Comprising six galleries featuring over 100 lavish pictures of original historical samples, it is the biggest educational display of busts and statues ever mounted. Its publication, in 2008, single-handedly deflated to zero a market that had netted hundreds of thousands of dollars annually, by the sale of “repro” bronze art busts at leading Canadian fine art auctions where they had been offered as “originals” by the artist. “The Cornelius Krieghoff Collector Fakes Detector” – In a personal confessional – for which he was threatened with a lawsuit, by lawyers of one of Canada’s top fine art auctions – John Goldi changed the names to protect the guilty, and still published the entire original consumer alert article, to give valuable information for art collectors, and offer a rare insight into what can happen to you if you take at face value what you find when you set out to spend good money at one of Canada’s top fine art auctions, and end up with bad, very bad art. The man and the camera that took the world’s very first genuine front line combat photo. “James Cooper Mason: the World’s First Combat Photographer” – It features the incontrovertible documentary research which proves conclusively that a Canadian banker, and a volunteer in the Anglo-Boer War, took the world’s very first genuine combat photo. John Goldi’s research uncovered the camera Captain James Mason used, and the letters where he wrote of his hair raising incident, during which he only put his head up for seconds, to take his iconic image, and in that instant had his helmet hit and his badge shot off, at Paardeberg, Bloody Sunday, February 18, 1900. The 1899 Canadian RCR Guard Room discovered by John Goldi in Belmont, South Africa. 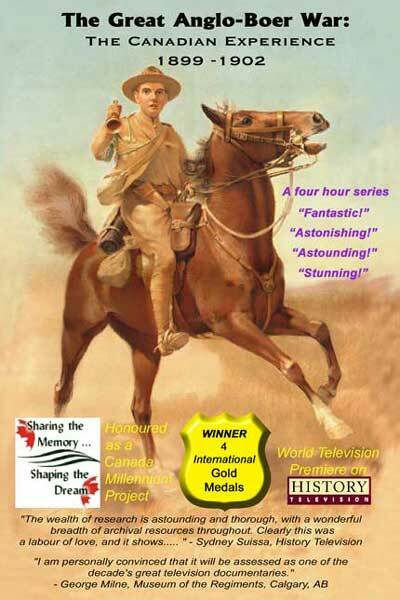 “The Belmont Discoveries” – John Goldi discovered three major historic sites related to Canada’s First Contingent stay in South Africa in 1899, all of which were unknown to Canadian academics, military or government officials, and were unpublished in any literature, and locally totally unmarked. Using archival books he took to South Africa he was able to discover the existence of the Royal Canadian Regiment’s hospital, and the RCR guard room, both still standing, 100 years after the Canadians had left them. He also discovered dozens of rock inscriptions on a remote hillside where they were carved by Canadians in 1899. All were previously unknown, unplaqued, and unmentioned anywhere. Some of dozens of inscriptions previously unknown in Canada, discovered by John Goldi in 2000, near Belmont, South Africa. “The Belmont Project Submission” – It is a major report summarizing John Goldi’s findings, following the most in-depth exploration of Canadian Boer War sites in South Africa ever carried out by anyone – eight weeks of research and 11,000 kms of driving. His submission to the Minister of Canadian Heritage resulted in the Canadian Government establishing “Canada and the South African War an event of national historic significance,” as noted in a personal letter he received from Stéphane Dion, Minister of Canadian Heritage. On the battlefield at Paardeberg, by the mass grave where some of the 31 Canadians who died there were buried. “OUTRAGEOUS! Four International Gold Medals…!” In an unprecedented achievement for a television series, John Goldi csc, and his wife Joan Goldi, carried out all the craft functions to create a prime time television history series, of four one-hour programs, and entered them in competition against the best in the world at Worldfest Houston, the world’s largest film and television festival. Hunter Todd, President of Worldfest contacted them to report his astonishment – he called it “Outrageous” – that their program had won an unprecedented FOUR GOLD MEDALS AT HIS FESTIVAL, for Best Program, Best TV Series, Best TV Writing, and Best On-Camera Talent. “Fake Great Canadian Heritage War Photo” – John Goldi uncovered, and publicized, the fact that Canada’s most famous combat photo, touted as genuine by the Canadian War Museum and Archives Canada for 100 years, and featured on the cover of Canada’s first pictorial book on the Anglo-Boer War, was in fact, a very badly darkroom-doctored fake, and had nothing to do with Canada or Canadians at all. “You Gals Sure Made Me Laugh – 43 Times” – John Goldi uncovered and publicized no fewer than 43 huge and egregious pictorial errors of fact in Canada’s worst publishing disaster in history, which resulted when the Canadian War Museum collaborated with two women with no academic credentials, or research background whatsoever in the field, and all had a gas, picking the pictorials for Canada’s first ever illustrated book on the Boer War, and desecrated an otherwise fine work written by top Canadian historian, Carman Miller. J Heath 1840s Lake Ontario Scenery pattern that Elizabeth Collard failed to see was actually of Dundurn Castle at Hamilton and some of the many waterfalls in the area. “Elizabeth How Could You?” – John Goldi uncovered and publicized that Canada’s top expert in 19th century pottery and ceramics, the late Elizabeth Collard, had committed a huge error by wrongly interpreting the images on the J Heath Ontario Lake Scenery Ceramic Dinner Ware Service of 1845-1853. “Fake Paul Kruger Transvaal Money Box” gave detailed pictorial information on how to tell genuine original, from period repros, and latter-day fakes.